The ScrapOnizer Scrapbook Storage solution is a relatively new product, introduced in Jan 2008 at the Winter CHA and shortly thereafter was awarded Best of Show. This little organizational system fits in the space of a magazine holder and is a fraction of the cost of most organization systems. Economical, easy, compact, unobtrusive, versatile, and convenient are only a few descriptions that fit this system perfectly! You can organize your arts & crafts, photos, scrapbooking tools and embellishments, toys, beads and findings, and even hardware and fishing gear. 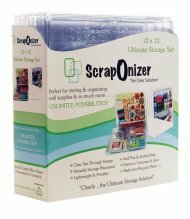 The ScrapOnizer Scrapbook Storage System comes with 4 cases - each 8 ½ x 11 inches. Each case is made from high impact acid-free (safe for scrapbooking) poly-vinyl material, and is an absolutely clear design so you can see what is stored from back and front. The secure snap-lock design system keeps items in each container separate while closed regardless of the storage position of the case. They can be stored flat like drawers or upright like books. When you close the lid, the tray "tongue and groove’s" to the lid, so items stay in the compartments you put them in. The cases are light weight, durable, and portable and the kit comes with 4 different storage cases and one shelf case holder. 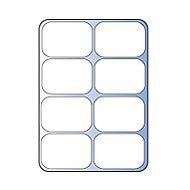 The cases and the Shelf holder are completely customizable and come with 17 self-adhesive labels, and each has a separate removable compartment tray. Here's a video form the Winter 2008 CH so you can see the product outside the packaging and see how they can be customized. The entire Toolbox set measures approximately 4.5” Wide x 12.25” High x 10.25” Deep. Individual cases each measure approximately 1” Wide x 12” High x 10” Deep. The ScrapOnizers, being acid-free, are safe and ensure protection for you all your papers, photos, and collectibles,to help preserve them and prevent fading, yellowing, tearing, wrinkling, bending and discoloration. The"Living-Hinge" design allows for easy entry and a lifetime of use in organizing and storing embellishments, tools, paper and more. 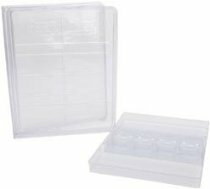 When you purchase the ScrapOnizer Scrapbook Storage kit, along with the 4 cases are inside trays. 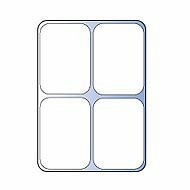 There is a 2-compartment tray, a 3 compartment tray, a 4 compartment tray and an 8 compartment tray. 2 compartment tray - each compartment measures 5.5" X 8.75"
3 compartment tray - each compartment measures 3.75" X 8.5"
4 compartment tray - each compartment measures 5.5" X 4.25"
8 compartment tray - each compartment measures 2.5" X 4.5"
Individual 4 packs of each tray configuration and "Living Hinge" outer cases are also available for purchase to further customize your organizational needs. When purchasing the ScrapOnizer Scrapbook Storage system, please be careful to check for Cases with Compartment Trays verses Outer Cases only. Introduced at CHA 2009 Winter - Jan 2009 - the Cricut Cartridge Storage package contains one 11 by 8-1/2-inch storage folder;a standard three compartment insert tray and a cartridge insert (perfect for holding four Cricut cartridges; keyboard overlays and books). Also introduced at CHA 2009 Winter were the ScrapOnizer Snap-Lock Mini Containers available 8 to a package. This ScrapOnizer Scrapbook Storage set contains: (8) 1" x 2-1/8" x 2-5/8"self contained mini compartments that fit perfectly in the 4 and 8 compartment trays. 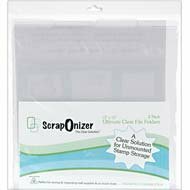 These ScrapOnizer Scrapbook Storage mini's are sold separately and are great for storing very tiny items and may not need an entire compartment of their own. Also available are the ScrapOnizer File Folders. These clear plastic tabbed file folders, made of 100% recycled plastic, fit nicely inside the Scraponizer Scrapbook Storage cases and are sold separately. These come 2 to a package and are 8.5"X11". 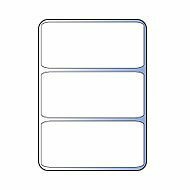 These file folders are a clear solution for unmounted stamp storage. You can adhere your unmounted stamps to each side of the file folder, giving you 4-layers of unmounted stamps in each case. You can also use these for stickers, papers or as a cover for a scrapbook album. I store my 8½ x 11 Stencils and Templates in these as well to keep them from warping. 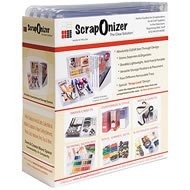 #A2 ScrapOnizer and 12" x 12" ULTIMATE SET - this set comes with 4 of the 12 x 12 outer cases and 3 of them come with removable trays and one is open for paper storage, pre-made page sets, or taking items to complete a page to a crop. I even take an empty one with me when I shop for scrapbook paper. I can put my paper purchases right in there and then I don't have to worry about getting them wrinkled or dog-eared before getting them home. If I am planning an entire themed album, which I do a lot of, I collect all items in one and when I go to scrap that album, I have everything together like my own mini-kit. This set also comes with a customizable holder and white self adhesive labels that can be customized to match your scrap room. Outside dimensions are 4.5" Wide x 13.75" High x 14" Deep. 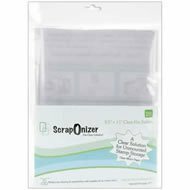 The ScrapOnizer 12 x 12 Ultimate File Folders come 2 per package and are tabbed and clear like the smaller ones. 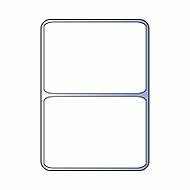 Just likethe smaller file folders, these are great for unmounted stamp storage and are also good to store stencils and templates to keep them from warping. And don't forget, they can also be used as a clear scrapbook cover. and see your Amazon Wish List; search for other products; or see product reviews. 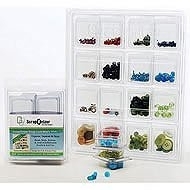 When you purchase from this ScrapOnizer Scrapbook Storage page, you are actually purchasing from Amazon.com. All orders go through Amazon's secure order server. from the ScrapOnizer Scrapbook Storage Systems.